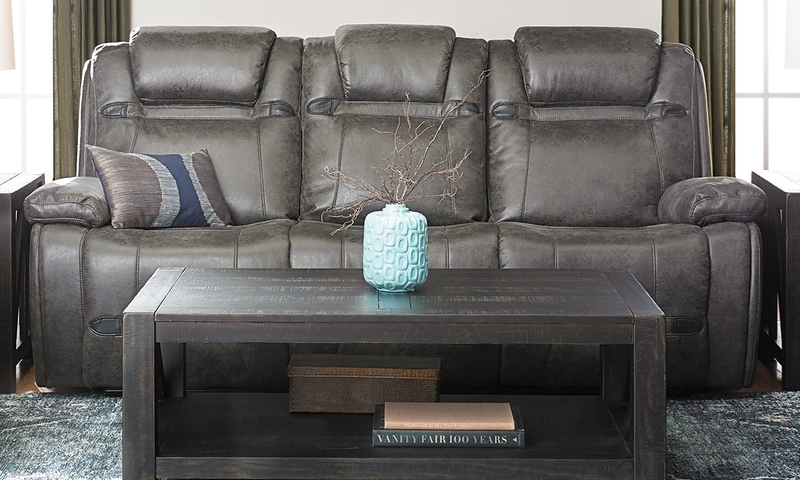 Binge-watch to your heart’s content with the Rebel power reclining sofa, upholstered in gray high-grade fabric. Enjoy access to an infinite number of comfortable positions at the push of a button, with a tailored lumbar area and full-leg chaise for total body support. Power adjustable headrests, bucket seating and plush pillow top arms take relaxation to the next level. The center back drops down to reveal a table and cup holders perfect for snacks, along with a storage pocket to keep the remote control close at hand. The table’s pop-up charging strip and the USB ports on both sides of this sofa ensure that your electronic devices will stay connected for hours on end.